The kingdom of Uí Dróna seems to have occupied the present Barony of Idrone East and West along with the half barony of St. Mullins. Land on the west side of the River Barrow about Graiguenamanagh and Ullard also formed part of the kingdom. The royal family of Uí Dróna claimed descent from Dróna which was fourth in descent from Cathaeir Mór. After the adoption of surnames the chief family of Uí Dróna took the name of Ryan. These are to be distinguished from the Ryan family of Tipperary. This article hopes to provide some history of the kingdom given the limited references to Uí Dróna in the Annals and other manuscripts. The early history of the kingdom of Uí Dróna is lost in the darkness of time. Yet it seems from later stories during the Iron Age the kingdom was an important place. The origin legend of the Laigin, the people who later formed the provincial kingdom of Leinster and occupied many of the sub-kingdoms within, claimed to have come across the sea from Gaul under the leadership of Labraid Loingsech. One of the early battles fought by the Laigin in their conquest of Ireland occurred in Uí Dróna. There they caused the destruction of Dinn Rig, a large hill top fort near Leighlin Bridge. After advancing across Leinster and Munster the Laigin were driven back into south Leinster – an area later consisting of the Counties of Carlow, Wicklow, Wexford, and parts of Dublin, Kildare and Laois. More fitting than a foreign territory. The Kingdom of Uí Dróna had its own royal family, coronation site, chief palace, royal poet, gentry, farmers and slaves like any other Irish kingdom of its day. A story is told about the fate of seven female slaves from Uí Dróna. Once upon a time Seamplán, priest of Tír Dhá Ghlas, went on a visit to Tír Chroinin and Leac Náire on business in the company of a number of clerics. As they approached the house of Diarmuid, who was cleaning the front of his house with a shovel, the party were set upon by the hound of Diarmuid. The hound mangled Seamplán and in defence, Seamplán struck the hound. Then in anger Diarmuid struck Seamplán with his shovel and broke the reliquary of Colum that was on his back. To seek compensation for breaking the relic, the coarb of Colum went to the Prince of Uí Dróna, Ruidhéan, son of Laimhean, and the Uí Dróna gave the coarb seven female slaves from Diarmuid to the people of Colum and to Lachtain. The seven female slaves were then given to Uamhnach, erenagh of Leamhdhruim. This story from Uí Dróna history raises a problem with researching Irish history using the Annals and the various genealogies. A person named in the Annals does not always appear in the genealogies and vice versa. For example, Ruidhéan, son of Laimhean, Prince of Uí Dróna, does not appear in the genealogy lists yet he is mentioned in the “history” stories. 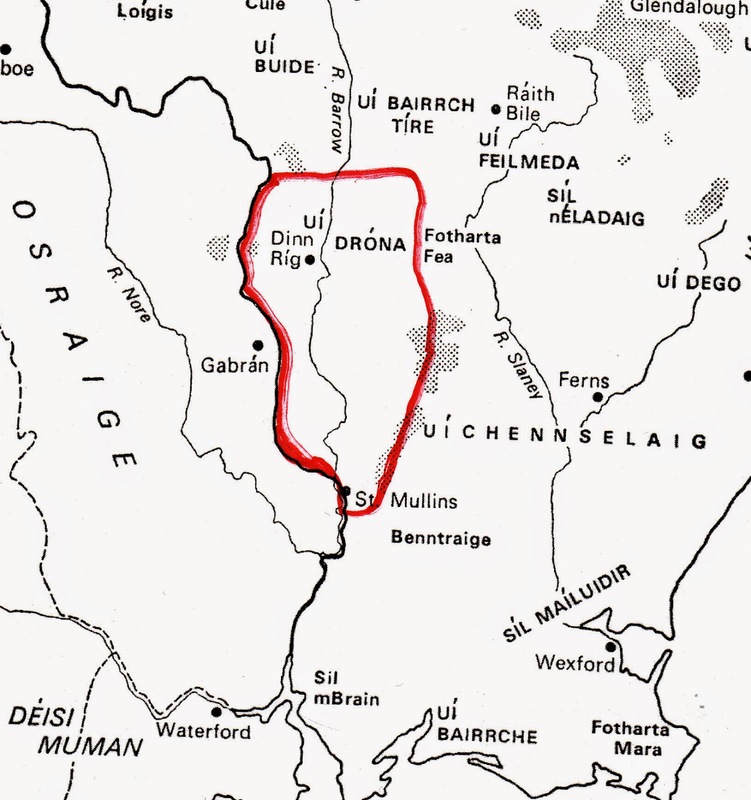 A small kingdom like Uí Dróna only features in the records when its story links up with the history of an adjacent big kingdom like Osraige of Uí Chennselaig. Tracing the full history of Uí Dróna is therefore a difficult task full of many gaps and information that cannot be properly explained. It is possible that Ruidhéan, son of Laimhean, was Prince of Uí Dróna before Áed Rón became king thereof in about 700. The genealogists placed Drón as ancestor of the Uí Dróna royal family and the person who gave the kingdom of Uí Dróna its name. Drón was a brother of Énna Cennsalach who was the ancestor of the Uí Chennselaig royal family and lived in the mid fifth century. A later entry in the Uí Chennselaig genealogy mentions Áed Rón, son of Crundmáel (King of Leinster, d.656), as King of Uí Dróna. This Áed Rón was the great, great, great, great, great grandson of Énna Cennsalach. The recorded Annals are silent about this change in the Uí Dróna royal family. Maybe the reference to Drón as a brother of Énna Cennsalach was just a fabrication; a way of just saying that the kingdoms of Uí Dróna and Uí Chennselaig were political allies. This story of two different royal families in Uí Dróna seems to fall into the political story. The Uí Chennselaig were originally based around Rathvilly in northern Carlow but around 600 they were driven south into modern-day Wexford after failing in their attempt to push north and control the Liffey valley. It would seem that as the Uí Chennselaig went south they conquered not just Wexford but other small kingdoms like Uí Dróna and installed a small branch of the family as the new royal family. The history of Leinster and Uí Dróna in the fifth and sixth centuries is very scanty and confusing. What is called history from that time seems to be a combination of fiction and guesswork. The seventh century is still no better with more obscurity than clear facts. It is only in the eight century that the Annals deal with Leinster in any detail. In history as in archaeology, the only story you can tell is the one based on the presented facts. When new information comes to light the course of the story may change or even be rewritten. Later records show that the descendants of Áed Rón did not confine themselves to rule just the kingdom of Uí Dróna but had bigger ambitions. Áed Rón was a member of the Síl Cormaic segment of the Uí Chennselaig genealogy. The two chief lines of Síl Cormaic provided thirteen kings of Uí Chennselaig between 624 and 978. On the provincial scene Donngal (d.761), Dub Calcaig (d.769) and Cairpre (d.793) were each kings of Leinster and all great grandsons of Áed Rón. The genealogists say that Áed Rón, king of Uí Dróna, was the ancestor of the O Ryan family of Idrone, the post Norman name for Uí Dróna. Áed Rón was the father of Colman with Laignen, his son, Cairbre, his son, Hugh, his son, Bruadar, his son (ancestor of Broderick family) and Dubhghall, his son. Righin was the son of Dubhghall and gave his name to the O Righin family which was later changed to Ryan. Cairbe was the son of Righin and Teige was his son, Donoch, his son, Melachlin, his son, Lucas, his son, Daithi, his son, Neimheach, his son, Jeffery, his son, Henry, his son and Henry Mulrian, his son. This genealogy appears to be in proper order. If we take thirty years per generation then Áed Rón was alive about the year 690 and Henry Mulrian was alive about 1200. This would be in line with historical context as after 1170 it would be acceptable for Irish families to adopt Anglo-Norman names such as Henry and show their approval for the new masters. However the first Henry O’Ryan that appears in historical records is from the 1420s when Henry O’Ryan was described as Lord of Idrone. If indeed this 1420s reference was the first Henry O’Ryan then it would appear that the genealogists had cemented on the later pedigree of the family unto the very earliest ancestors of the family without giving a thought to the large time gap between the early ancestors and the later family. Professor Eoin MacNeill once wrote that “In endeavouring to arrive at a basis for the earliest part of Irish history, and to distinguish the true historic from the prehistoric period, I have from time to time described certain views and statements, which purport to be historical, as the creations of a number of writers whom I have called the synthetic historians”. One could say that there was some “synthetic historian” at work with the O’Ryan pedigree of Idrone or that more investigation is needed. There is a record for a Domnall, son of Lorcan, King of Uí Forga, dying in battle against Maelsechlainn, High King of Ireland, in 990. This kingdom of Uí Forga was said to be in the region around Nenagh in County Tipperary. It is difficult to known how Christianity was introduced to Uí Dróna and how it spread among the people. The acceptance of Christianity by the king usually encouraged his people to follow the new religion. When and where the first church in Uí Dróna was, is open to debate and discovery. The earliest documented church of significance was at Old Leighlin. Here about 600 St. Gobban is said to be first abbot of a new monastery but he didn’t stay long at Leighlin. Instead he left to found a new monastery and gave the abbacy of Leighlin to St. Mo-Laise who had returned from Rome or so it is said. In reality St. Gobban was possibly the legendary figure called Goban Saor, a figure noted for building with stone. Therefore St. Mo-Laise could be the first abbot/bishop of Leighlin. St. Mo-Laise was active in encouraging Ireland to adopt the Roman method of calculating the date of Easter. A major synod held at Leighlin in 630 under the chair of St. Mo-Laise the Irish church adopted the Roman date for Easter. But the controversy over the date of Easter continued until the Synod of Whitby in 664. St. Mo-Laise died about 639 or 641 leaving a large monastery of about 1,500 monks. In 1111 the monastery of Leighlin in Uí Dróna was chosen as one of the five bishoprics in Leinster. In the early 620s St. Moling from Luachair was active in the southern part of Uí Dróna. According to genealogists St. Moling (also known as Taircheall) from Luachair was the son of Faoileann, son of Fearadhach, son of Earc, son of Fiachra, son of Eoghan, son of Daigh, son of Labhraidh who was the son of Bressal Bélach, King of Leinster. This Daigh, son of Labhraidh, was a brother of Enna Cennsalach (ancestor of the Uí Chennselaig) and of Drón (ancestor of the Uí Dróna). By this genealogy St. Moling was connected with the chief families of South Leinster. St. Moling founded a monastery beside the River Barrow near the southern point of the Uí Dróna kingdom. The monastery grew large and became known as Tech Moling or the House of Moling. The place later became known as St. Mullins. It is said that St. Moling was granted the site by St. Aidan, Bishop of Ferns (d.625) and that St. Moling succeeded St. Aidan as Bishop of Ferns. This foundation story may be a later invention to emphasise the political alliance between Uí Dróna and Uí Chennselaig in the eleventh and twelfth centuries. St. Moling’s chief political claim to fame was in relation to the bóruma, the supposed tax levied on Leinster by the Kings of Tara since the first century. When Finsnechta Fledach was High King, he was approached by St. Moling to grant a remission of the bóruma until Monday. Finsnechta Fledch agreed to this until St. Adomnan told him that the Monday meant was not in a few days’ time but the Day of Judgment which according to the Irish would happen on a Monday. Finsnechta Fledach got so mad that he poured curses on St. Moling to which the saint replied with curses and Finsnechta Fledach died in 695 by the hands of his cousins. St. Moling died according to the Annals of Inisfallen in 696 while the Annals of Ulster give it as 697. Apart from St. MoLaise and St. Moling a number of other saints were associated with the kingdom of Uí Dróna. These include Foirtchearn (from Ath Truim in Laoghaire and from Ceall Fhoirtcheirm in Uí Dróna, 11th October), son of Feidhlimidh, son of Laoghaire, son of Niall Naoighiallach and Bairrfhionn of Achadh Cailltean on the west side of the River Barrow at Killoughternane in Uí Dróna. Bairrfhionn was a brother of Fionnbharr of Inis Domhail and son of Aodh, son of Dallán, son of Liathan, son of Bran, son of Eóghan Brec, son of Art Cearb who was son of Cairbre Nia. It is only in the tenth century that the history of Uí Dróna enters into the Annalistic record in any helpful way to construct the kingdom’s history. In 906 [910 in Annals of Ulster, alias 911] Aedh, son of Dubhghilla, King of Uí Dróna of the Three Plains, was also tanist of Uí Chennselaig. Thus the connection between the royal family of Uí Dróna and that of Uí Chennselaig may not be as fabricated as we first thought. Tis easily known by Aedhan’s rath [Ferns] that Aedh is dead, oh youths. It is not known who succeeded Aedh as lord of Uí Dróna but in 944 Dunlaing, son of Aedh, slain as Lord of Uí Dróna. The circumstances of his death were not recorded. The biggest military activity of 944 was made by the Vikings of Dublin as they raided Clonmacnoise and the monasteries of Meath. Although Uí Dróna was crowded over by the more power kingdoms of Osraige and Uí Chennselaig it was still sometimes recognised as a full kingdom. In 1016 Tadhg Ua Riain was described as King of Uí Dróna. In that year King Tadhg was killed in the middle of Leighlin along with Donncuan, son of Dunlaing, King of Leinster by Donnchadh son of Gillapatraic. The circumstances for the killing were not stated but the scribe of the Annals of Ulster said there was “peace in Ireland”. mutual oaths shall not prevent bloodshed. In 1071 another Tadc Ua Riain was described as King of Uí Dróna. In that year there was a battle in Leinster between Domnall, son of Murchad, grandson of Mael na mBó and Donnchad son of Domnall Remar. It is not clear on which side King Tadc Ua Riain died but he was killed along with many other soldiers and chieftains. The battle was a civil war encounter between Domnall son of Murchad and Donnchad son of Domnall Remar as both were close cousins within the Uí Chennselaig kingdom. In 1087 a great battle was held between the men of Munster and those of Leinster at the Fort of Edar which was said to be in the vicinity of Howth, Co. Dublin. The Munstermen were victorious and there was great slaughter among those of Leinster. Among the dead was the son of Murchadh Ua Domhnaill, Lord of Uí Dróna and possibly a good number of his followers. The people of Uí Dróna had to deal with this loss while also suffering the death of their cows and the destruction brought by a powerful wind which knocked houses and churches. In 1103 Ua Riain, King of Uí Dróna, went north into Ulster with his army as part of a grand army from Leinster, Ossory, Munster and from the Viking communities under the leadership of Muirchertach O Briain. A great war had broken out between Cinel Eoghan and the Ulstermen. Muirchertach had gone to help the Ulstermen. But the campaign was far from successful. Instead Muirchertach was defeated in the invasion of Dal Araidhe. Subsequently the Ulstermen took advantage of this defeat to attack the Leinstermen and those of Ossory at Magh-Cobha. The battle between the sides was fiercely fought but the Leinstermen were defeated with great slaughter. Among the dead was Ua Riain, King of Uí Dróna. In 1111 the monastery of Leighlin in Uí Dróna was chosen as one of the five bishoprics in Leinster. The new diocese of Leighlin included a larger area than just the kingdom of Uí Dróna but the two religious centres within Uí Dróna, namely Leighlin and St. Mullins were important places in the new diocese. Some writers have suggested that St. Mullins was part of the new diocese of Ferns because of its long association with Ferns monastery but St. Mullins was included in the deanery of Idrone in the diocese of Leighlin. The county boundary between Wexford and Carlow was changed in the early seventeenth century and this change placed part of St. Mullins parish within County Wexford. By the 1160s the regal status of Uí Dróna was no longer recognised by its more powerful neighbours. Instead Diarmait Ua Riain was described as duke of Uí Dróna. But other people such as the author of the Song of Diarmait still recognised Diarmait Ua Riain as king of Uí Dróna even if he was called a rebel king. In the period 1162-65 King Diarmait Ua Riain gave certain lands to establish the Benedictine house of Killenny which foundation was confirmed by Diarmait Mac Murrough, King of Leinster. Felix, abbot of Ossory was to provide the religious foundation with monks while King Diarmait Ua Riain gave land in Dunleckny parish and elsewhere. By 1185 Killenny changed its order and became Cistercian, subject to Jerpoint. Killenny continued to be ruled by an abbot but by the 1220s the house was heavily in debt. In 1227 Killenny was suppressed and was united to Duiske Abbey at Graiguenamanagh. An attempt was made about 1276 to restore the independent abbey but without success. Even after the suppression of Killenny as an independent abbey the O’Ryan family did not abandon it. In 1424 Henry O’Ryan, lord of Idrone, confirmed the lands granted by his ancestor Diarmait Ua Riain to Killenny. In 1540 Killenny was referred to as “Old Abbey” and was listed as a grange of Duiske Abbey when it was held by Charles Kavanagh, last abbot of Duiske. Charles Kavanagh was buried at “Old Abbey” sometime about 1558 when he was said to be about one hundred years old. The location of Killenny or “Old Abbey” is unclear but the townland of Barrowmount near Goresbridge is suggested. It seems initially that the leaders of Uí Dróna opposed the claims and campaigns of Diarmuid MacMurrough to recover the kingship of Leinster. After May 1170 the men of Uí Dróna joined those of Waterford city and the Deisi in attacking Raymond le Gros Fitzgerald at Baginbun promontory fort. The Irish lost the battle and Waterford city fell shortly after. The Uí Dróna may possibly have supported the joint Uí Chennselaig and Norman invasion of Osraige in 1170 but this is unlikely considering other events. When Richard de Clare (Strongbow) landed at Waterford in August 1170 the joint army marched on Dublin where after some resistance they took the city. After taking Dublin the invaders and the Uí Chennselaig seemed to have prospered together. Richard de Clare married MacMurrough’s daughter, Eva, and began to parcel out parts of Leinster to his followers. In about 1170 Richard de Clare (Strongbow) granted St. Mullins and its half cantred to Peter Giffard. This charter was witnessed by Richard, Ralph and Ruelet Bluet among others. Members of the Bluet family were tenants of Richard de Clare in various parts of his estate in English and Welsh lands. They got lands at Kilcorkey in Wexford. But when Diarmuid MacMurrough died in the winter of 1171 the tide quickly changed. The lords and kingdoms of Leinster (including Uí Dróna) refused to recognise Richard de Clare as King of Leinster. The usual warring Irish stopped their fighting and arrayed themselves together against the Normans. Richard de Clare was besieged in Dublin while his gains in Leinster disappeared. But the Irish army failed to see the job through and the Normans sallied forth and defeated the Irish army. “That he [Earl Richard de Clare] came to Odrone / Now the Irish of the district / Were assembled at the Pass [Scollagh Pass], / To meet the Earl Richard, / At one side they were assembled: / To attack the English / Were the Irish assembled. / The Earl Richard with his men/ Through the midst of the pass in safety / though surely to advance / when an obstacle met him. The rebel king of Odrone, / O’Ryan was his name, / Shouted out loudly: / “To your destruction, Englishmen, have you come!” / He rallied his men to him, / And attacked the English sharply; / And the English, of a truth, / Manfully defended themselves. / But Meiler, son of Henry / Carried the prize that day / In the battle, known in smooth / There was no better than the son of Henry / And much renowned that day / Was Nicol, a cowled monk / For with an arrow he slew that day / The lord of Odrone / By an arrow, as I tell you / Was O’Ryan slain that day / And Meiler, the strong-limbed baron / Was stunned by a blow / Of a stone in this fight / So that he reeled to the ground / But when O’Ryan was slain / The Irish separated / This wood was afterwards named / And called the Earl’s pass / Because the Earl was attacked there / By his enemies”. In 1175 the half cantred of St. Mullins, along with the cantreds of Idrone East and Forth in County Carlow, was granted to Raymond le Gros Fitzgerald by Richard de Clare on the occasion of the marriage of Raymond to Richard’s sister, Basilia. Raymond le Gros left no legitimate children and five knight’s fees in Idrone were granted by Raymond to his brother, Odo de Carew Fitzgerald or to his nephew, William de Carew. Elsewhere it is showed that William de Carew held Dunleckny and St. Mullins. 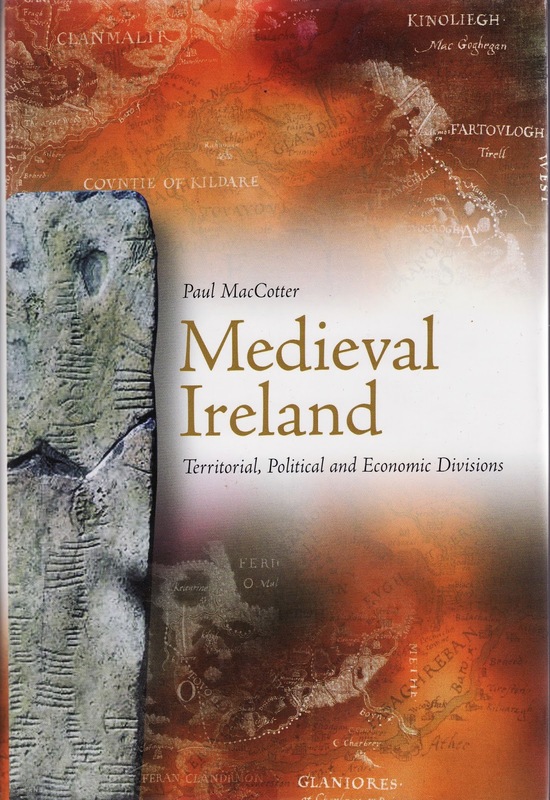 For a topographical study of the relationship between Idrone and the earlier kingdom of Uí Dróna see the book by Paul MacCotter, Medieval Ireland: Territorial, Political and Economic Divisions (Four Courts Press, Dublin, 2008). The Anglo-Normans held Idrone until after the Black Death in 1350 when a number of factors caused the decline of their influence and the rise of the Irish influence. By the late fifteenth century much of Idrone was in Irish hands.